Visit a Wilde Meyer Gallery to experience contemporary innovation and creativity at the optimum. Entering one of our galleries is a sensory experience with WOW factor. 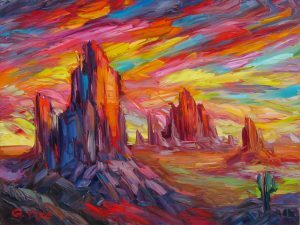 Wilde Meyer Galleries in Scottsdale and Tucson have changing exhibits of original contemporary fine art with subjects including abstracts, landscapes, figurative, and contemporary western. Media include paintings, bronzes, sculpture, glass and more. Wilde Meyer Gallery, 4142 N. Marshall Way, Scottsdale, AZ. Gallery Hours: Monday-Friday, 10:00 to 5:30 pm, Saturday 10:00 am to 6:00 pm. Open for Artwalk every Thursday 7 pm to 9 pm. A special show for special artists whose animal depictions run the gamut of interpretations. Artists use their imaginations to go beyond the expected interpretations of our wonderful desert.